Hold the CHIMELLA in position with one hand on the release button which should be facing you to ensure the canopy arms reach the corners of the flue. The top of the release button should be directly below the flue opening and about 620mm below the narrowest part of the flue. Keeping The CHIMNEY UMBRELLA pointing directly under the flue opening is essential to the successful launch of your chimney-blocking device. A simple push of the release button with your thumb allows the extendable shaft to reach its full extension up the chimney before automatically opening the canopy to hold itself in place. Once in place simply twist the button handle gently from side to side (DO NOT TWIST THE DISPLAY HANDLE) to ensure that the corner canopy arms are pushed securely into the corners of the flue, producing a better seal. 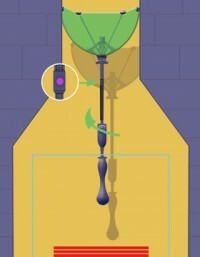 If you need to get an extra tight fit, just reach up the shaft to the purple spot and hold it in position. With your other hand gently pull down on the button handle and this will squeeze the canopy arms tighter to the walls. Your CHIMELLA is now saving you energy and money. The display handle has been designed so it can always be on view at a position of your choice so that you always know whether your CHIMELLA is in place. Simply hold the button handle in one hand and pull down gently on the display handle with the other hand and extend down. The display handle is also flexible to move forward or backwards without affecting the position of the canopy.